You know that old saying, “It is better to remain silent and be thought a fool than to speak out and remove all doubt.” Every time Bush speaks, his poll numbers drop. And, when He tried to explain away some gaffe he makes, he ends up saying something even more embarrassing. President Bush said Monday he wasn’t trying to disparage the party now running Congress by referring to it as the ‘Democrat majority’ as opposed to the ‘Democratic majority’ in his State of the Union speech. Bush’s dropping of the ‘ic’ at the end of the word prompted grumbling by Democrats that he purposely got their name wrong. Bush said he wasn’t even aware that he had done it. 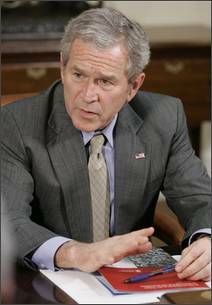 ‘I meant to be saying, why don’t we show the American people we can actually work together?’ Bush said. Freudian slip? Dyslexia? Stupidity? Whatever the explanation, it is no wonder that the majority of the American people just want the Bush Presidency to be over. This video clip has been showing up on a number of blogs since yesterday, but I don’t think it can be shown enough. I really cannot recall hearing a politician speak with more clarity and integrity than Chuck Hagel does here. I wonder if Craig and Crapo will take Hagel’s challenge and come home to Idaho willing to “look us in the eye” and explain the “coherent strategy” for Iraq that they think is worth putting 21,000 more American lives into the meat grinder for. Of course they won’t. At best they will wheel out well worn platitudes and patriotic cliches that parrot those spouted by Bush in the State of the Union. Hegel shows us all the difference between a statesman and a politician. Now that his nemesis, Ken Tomlinson, is gone (see here for the background, in case you have forgotten), Bill Moyers is back on PBS. On April 25th, he will return to PBS with Bill Moyers’ Journal. Progressive populists will now have Moyers’ commentary to complement Keith Olbermann’s “special comments” on MNBC. Here is Moyers talking about net neutrality at the National Conference for Media Reform last week in Memphis. In a luncheon speech to the Science and Technology Council Wednesday, Governor Clement “Butch” Otter urged support for community colleges by pointing out that students who get poor grades need a school that will admit them regardless of their qualifications. He used his own academic history as an example. “I wouldn’t have been able to get into a college anyplace because I didn’t have very good grades,” Otter said. “But at Boise Junior College they had to take me.” Boise Junior College is now Boise State University. Otter said the chance to prove he was a serious student at Boise Junior College helped him get into the College of Idaho, now Albertson College of Idaho. He said he was under academic probation when he attended the College of Idaho.”But I played football well enough that they kind of looked the other way,” Otter said. The Idaho Statesman has the whole story here. Thursday the House passed the energy bill that revoked massive government subsidizing of big oil companies and paved the way for the country’s greater energy independence, Speaker of the House Nancy Pelosi accomplished the goals she said the new Democratic Congress would achieve in its first 100 working hours in only 42 hours of floor time. The energy bill passed yesterday was the sixth of six items that Pelosi promised to push through in the first few weeks of Democratic control in the House of Representatives. Speaker Pelosi’s web site has the details of each piece of legislation along with a short video of the passage of each bill. Of the six bills (implementing the recommendation of the 911 Commission, increasing the minimum wage, expanding stem cell research, Medicare prescription drug costs, college student loan relief, and the energy bill) Mike Simpson voted yes on three (college loan relief, minimum wage and implementing 911 commission recommendations). As might be expected, Bill Sali voted against all six. This is an outstanding beginning for a House of Representatives that appears to be interested in making changes that will actually improved the quality of life for average Americans. 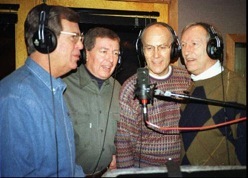 Ahh- the singing senators. Aren’t you nostalgic for the days of true bipartisanship? Well, Larry Craig is. He wrote an editorial on his web site called “Bipartisanship is a two way street.” Leave it to Craig to out-whine the other whining Republicans in Congress who, after just two weeks of the Democratic controlled Congress, are crying over mistreatment on the part of the party in power. It should surprise no one that Craig is out in front on this issue. For Craig, hypocrisy knows no bounds. If fact, his editorial is so bloated with hypocrisy the only reasonable response is laughter. Craig begins his hilarious screed with a dictionary definition of bipartisanship for us dolts who are unfamiliar with the concept and then explains what the big bad Democrats are up to. “Bipartisanship” is defined as something “marked by or involving cooperation, agreement, and compromise between two major political parties” – at least, that’s what Merriam-Webster tells us. To many Democrats in the new Congress, however, bipartisanship means a one-way street, where conservatives should vote for liberal policies. In the first days of the 110th Congress, the Democrat-controlled House of Representatives already passed new pay-as-you-go (PAYGO) budget rules that will restrain tax relief and make tax increases easier to approve. President Bush agreed to a minimum wage hike in the name of bipartisanship; and both Speaker Pelosi and President Bush – on separate occasions – made clear that tax increases are on the table. In other words, PAYGO rules, which require Congress to pay for any tax cuts with offsetting tax increases or spending cuts, is liberal legislation. PAYGO rules were in effect from 1990-2002 and are widely seen as having assisted the US Congress in maintaining budget discipline. Those rules were allowed to lapse in the House and watered down in the Senate, which made it easier for lawmakers to approve President George W. Bush’s tax cuts, contributing to our current gigantic budget deficit. I thought Craig was a conservative who believed in balanced budgets, but I guess fiscal responsibility is now a liberal policy. The funniest line in Craig’s editorial is, “President Bush agreed to a minimum wage hike in the name of bipartisanship…” What a joke. Bush “agreed” to a minimum wage hike because it will pass no matter what he says and he won’t veto it because, even if he did, too many Republican support it and the veto would not be sustained. The Democrats’ initial policies in the new Congress are not bipartisan – they’re just plain bad. Many Democrats seem to believe that bipartisanship means Republicans compromising our principles instead of negotiating on the Senate floor. I want to make clear that Republicans’ new status in the minority does not mean a blank check for liberal policies. Craig had better face reality. His empty threats and posturing make him appear irrelevant to his constituents back home. We knew it wouldn’t take long. The real question was, “Who will embarrass the state of Idaho first?” Wasting no time, Butch Otter came out of the gate with his vow to slaughter the wolf back onto the endangered species list. Gov. C.L. “Butch” Otter told The Associated Press that he wants hunters to kill about 550 gray wolves. That would leave about 100 wolves, or 10 packs, according to a population estimate by state wildlife officials.The 100 surviving wolves would be the minimum before the animals could again be considered endangered. “I’m prepared to bid for that first ticket to shoot a wolf myself,” Otter said earlier Thursday during a rally of about 300 hunters. Suzanne Stone, a spokeswoman for the advocacy group Defenders of Wildlife in Boise, said Otter’s proposal would return wolves to the verge of eradication. Idaho’s new governor may want to shoot wolves, but a diverse Washington state group will meet to determine what type of welcome mat will be laid out for any wolves that take up housekeeping here. Although there’s no evidence a wolf pack is living in the state, experts say it’s just a matter of time.To prepare for the return, the state has formed a panel of 18 hunters, ranchers, environmentalists and biologists to help write a wolf management plan. The group includes cattle ranchers, a sheep producer, environmentalists, local government officials and hunters. State fish and wildlife experts will work with the team as technical advisers. Art Swannack of Lamont, president of the Washington Sheep Producers, conceded wolves are not good for his business, but believes the planning team’s work could help avoid problems.”It’s going to take a lot of management planning, plain and simple,” Swannack said. What would newly elected Congressman Bill Sali do? Unwilling to let Butch usurp his crown as Idaho’s stupidest politician, Sali makes symbolic bid to abolish gravity, according to this morning’s Idaho Statesman. Angered by the passage of a bill to increase the federal minimum wage, Idaho Rep. Bill Sali offered a symbolic proposal to abolish the law of gravity. “Mr. Speaker, a number of my colleagues have pointed out the problems with raising the minimum wage; that it is an unfunded mandate on small business, will likely result in the loss of over 1 million jobs for low wage earners, that it will eliminate entry level jobs and actually hurt the poor more than it helps them. This is standard fear-mongering Republican rhetoric that fits nicely with Sali’s dogmatic anti-government stance. What makes Sali’s remarks before the House really laughable is the minimum wage experiment currently taking place on the Idaho/Washington border as described in a recent article in the New York Times. Just eight miles separate this town [Liberty Lake] on the Washington side of the state border from Post Falls on the Idaho side. But the towns are nearly $3 an hour apart in the required minimum wage. Washington pays the highest in the nation, just under $8 an hour, and Idaho has among the lowest, matching 21 states that have not raised the hourly wage beyond the federal minimum of $5.15. Liberty Lake and Post Falls are divided by more than the state line. Nearly a decade ago, when voters in Washington approved a measure that would give the state’s lowest-paid workers a raise nearly every year, many business leaders predicted that small towns on this side of the state line would suffer. But instead of shriveling up, small-business owners in Washington say they have prospered far beyond their expectations. In fact, as a significant increase in the national minimum wage heads toward law, businesses here at the dividing line between two economies — a real-life laboratory for the debate — have found that raising prices to compensate for higher wages does not necessarily lead to losses in jobs and profits. Idaho teenagers cross the state line to work in fast-food restaurants in Washington, where the minimum wage is 54 percent higher. That has forced businesses in Idaho to raise their wages to compete. Business owners say they have had to increase prices somewhat to keep up. But both states are among the nation’s leaders in the growth of jobs and personal income, suggesting that an increase in the minimum wage has not hurt the overall economy. It appears that Steve Jobs and Apple have done it again. I don’t need it. You don’t need it. 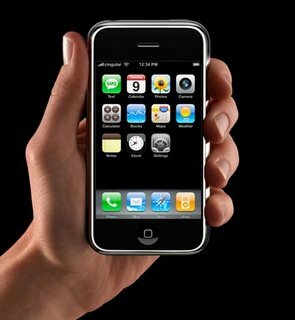 But, based upon Job’s Keynote at MacWorld yesterday, many of us will want the new iPhone once it is released this June. Like the iMac and the iPod, the new iPhone is a technological marvel surpassing anything else on the market. In fact, calling it a phone diminishes what this device can really do. Is it a phone? Is it an iPod? Is it a wireless internet device? No! It is Superphone combining all three with an amazing touch screen interface and with OS X inside. Like all Apple products, iPhone has a major “coolness” factor that had the audience at MacWorld oohing and aahing followed by cheering and clapping throughout the Keynote. The technology guru at the New York Times, David Pogue, is one of the few who have actually had a chance to play with the iPhone and he has an interesting article describing some of the more innovative features here.